In user, its allow to access rights individually by giving its rights module wise. 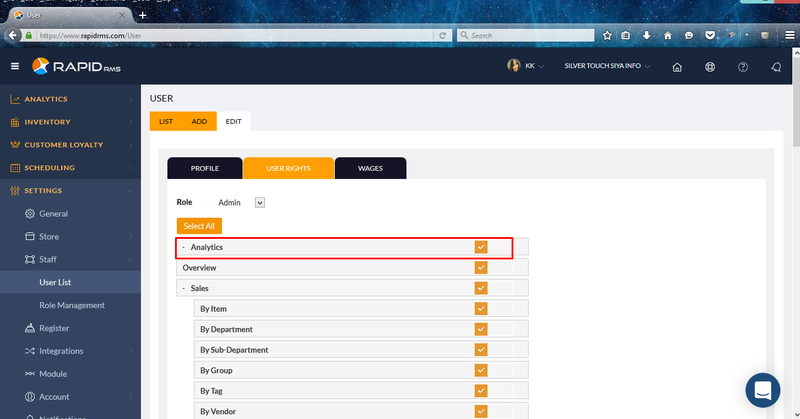 When user have rights of analytics then log in with that user then that all checked menu would display. I.e If overview is selected then user is allow to access overview and if not then vice versa. For all option display in rights would reflect according to selection and deselection. If in user any of option is selected then user is allow to access that menu and if option is unchecked then user would not have these menu in store for access. In all rights only POS rights is differ. All rights would apply in web log in but POS rights are for the IOS application.